Hired to assassinate a State Senator, an Ex-Federale known as Machete is later double crossed and left for dead by his conspirators. Machete then launches a relentless and blood drenched warpath to take down anyone connected with his former employer. Robert Rodriguez has done what I did not expect. He has taken his faux Grindhouse trailer and long-term idea and finally made a feature length film that is releasing under wide distribution. What's even better is he made a no holds barred action that does a polished job at resurrecting the Grindhouse genre for general audiences to enjoy. "Machete" is by all means, a adrenaline ride of mayhem. The revenge action is filled with scene after scene of gratutious violence. Directors Robert Rodriguez and Ethan Maniquis deliver exactly what is expected from a action/Grindhouse film. It is a rare art to make a movie that has bad dialogue, horrendous editing and pacing, but still have it be an endlessly enjoyable experience. "Machete" does exactly that, it knows exactly who it's audience is and caters to them perfectly. This is not a film to take your children to. This is not a film for the faint of heart, it is very much for fans of debauchery, bloodshed, bad dialogue and outrageous action. The biggest problem I have with "Machete" is pay off. The film opens extremely bold. The first 10 minutes of the film are so freaking out of control and so enjoyable it almost becomes too hard for Robert Rodriguez and Maniquis to keep the energy level flowing. In other words, they set the bar so high in the opening of the film, it takes awhile for the feature to get back up to the same insane level of action. The film also suffers from some very spotty pacing issues. The film stutters a number of times and by the end of the movie, it felt just a little bit too long. That said, it is overtly re-watchable. I will definitely watch "Machete" again and again. This film will easily be in my home collection. About the action itself, it is awesome. There is plenty of cheer worthy dismembering that happens by the hands and blade of Machete. The blood spray that is used throughout is flawless. Every gunshot that goes off delivers a wallop of blood behind it. Door and hallways are drenched with blood as Machete and others unleash their slaying. Gotta give credit to all the various weaponry Machete wields throughout as well. I loved seeing Danny Trejo weed whack a henchman's face or use a bone scraper to gut an attacker. Absolutely delightful ingenuity. Some mention must be made of the outstanding cast. Loved seeing Steven Seagal, Don Johnson, Jeff Fahey and Robert De Niro in bad guy roles. They were all perfect, as was Danny Trejo, who was born to play Machete. By all intents and purposes this is Trejo's movie and he does a fabulous job. Michelle Rodriguez, Cheech Marin, Shea Whigham, Lindsay Lohan and Daryl Sabara were all also immaculate in their performances. Many of the portrayals are suppose to be very over-the-top and this group does a notable job of delivering. Sadly not everyone is quite as enjoyable. Jessica Alba is a train wreck in the movie. All her scenes are grating outside of her looks. Unfortunately her character has a lot to do in the movie and whenever she would talk, I would quickly begin to to tune her out. Truthfully Alba, is the only weak link in the cast. Everyone else has just enough character development and the chops to pull off their characters, while Alba is a chore to cope with. I know plenty of you men are thinking I'm crazy, but use your other head, and you'll see what I mean. I want to acknowledge John Debney for his original music throughout "Machete." The score is sleazy in all the right places and perfectly builds up all of the action sequences. 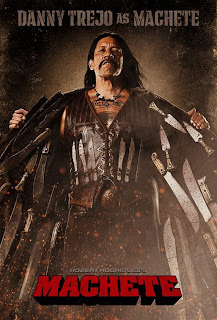 "Machete" is a blast and easily the best "Man on a Mission" movie I've seen this year. Robert Rodriguez has been slowly building a wonderful catalog of films and his latest Grindhouse effort is another to enjoy and cherish.